Building Dhows is an industry in the UAE the makes us feel proud. In addition, there are 2 people who are keep the industry going and they are Mohamed Abdulla from RAK and Mohamed Khamis from Um Quwan. In fact, it was important to not lose this industry that His Highness Sheikh Zayed gave Mohamed Khamis an area of pearl island in Abu Dhabi to say thank you for helping to keep the culture of the UAE alive by dhow building. 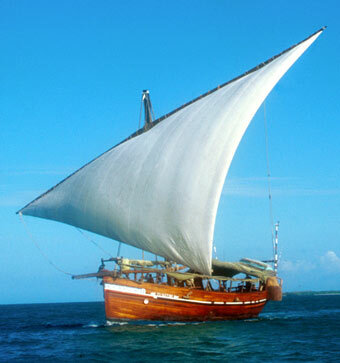 Dhows are made for local market and they also receive orders from overseas like UK and Europe. And, more than that there are many different kinds of dhows in sizes from 50 feet to 130 feet that are used for rowing, sailing, sports, fishing and taking things to othe countries. So important is the Dhow that Sheikh Zayed got Mohamed Khamis Highness to build him a number of dhows for different purposes. The industry, normally gets people who are attracted and fascinated by the nation's cultural. These people are highly skilled and they share their knowledge with the younger generations. To build a Dhow it take lot of hard work to build it. The wood comes from India or Pakistan and is teak or Mahogany which is very strong and doesn't let in water. It takes about 150-200 men over a year to build a 130 foot dhow. 1) Ghanjah which is a s a large ship. 2) Baghlah a medium-size sailboat . 3) Battil - which features a long stems topped by large, club-shaped stem heads. This article by Mohamed Abdalla Ibrahim.